Sold! Impeccable Cape in Beaver Pond Estates Beverly, Massachusetts. Located in Beverly, on the North Shore of Boston. This Beaver Pond Estate home was built in 1991 and has been well maintained and updated since then. The first floor has a large, spacious and bright eat in kitchen with tile floors and granite counters that opens to an inviting family room with a wood burning fireplace. Both have doors that open to a deck overlooking the .34 acre yard. The first floor also has a more formal living room with hard wood floors and a second fireplace. There is a generous dining room with hardwood floors and an abundance of natural light. The tiled entryway from the back has ample closets, a laundry room and updated half bath. There are four different bedroom spaces and two full baths on the second floor. The master bedroom is a spacious room with great light, high ceilings with a fan, two closets, one a walk in. The master bath has also been updated and has a tiled floor, double sinks and a large tiled walk in shower. The other full bathroom on this floor has been updated. The walk out lower level is finished as well for an additional family room, media, activity, office or play room. This room has windows that look out to the back yard. Additional amenities includes central vacuum, a full length deck and a two car garage. 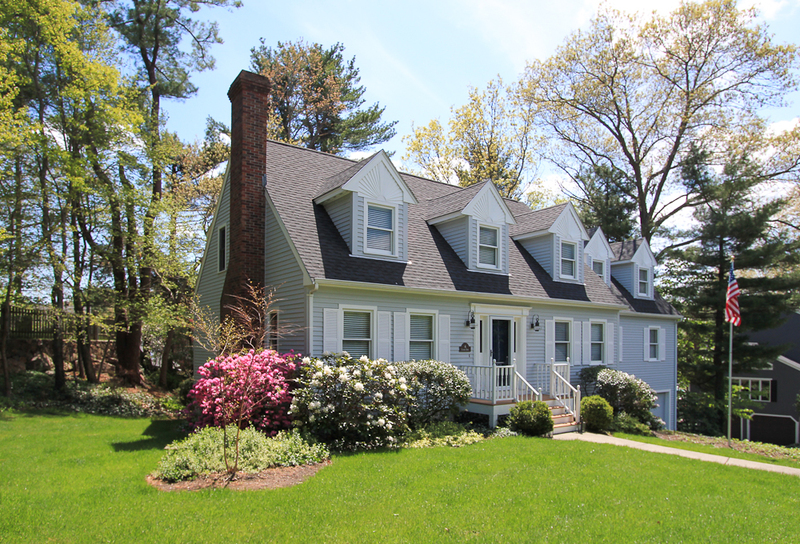 Set well on the lot in an established neighborhood, convenient to Route 128. This is the home of the week in the Salem Evening News read about it here. See the photo slide show below and the video.